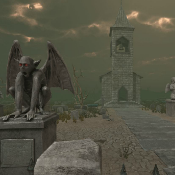 SD Haunted Cemetery Escape is another point & click escape game developed by Selfdefiant for Melting-Mindz. In this game, you went to sleep after having a bad day. All of a sudden you woke up, trapped inside of a haunted cemetery. Is this a nightmare or is it real? Look around, try to figure out how to escape and find out! Good luck and have fun! Hammer on left inside chapel doesn't have a hotspot. Looking for the handle to the well. That's my last gem. Finally found it. Last scene up on the right. Well camouflaged. I'm out! oh, SD goes a new style - nice! how could I miss the down arrow for a pretty long time...?! Good game, as usual. But, way too dark. And if you already have bad eyes, it was nearly impossible. If I hadn't gotten the hint about the hammer, I never would have finished. The atmosphere in this game was great! I thoroughly enjoyed playing! For anyone like me who couldn't find where to use the ladder? once inside the chapel, turn right and place ladder next to door and it takes you up to the belfry. I don't think gem order matters. I just put them in and was able to open the box. Nice game, I appreciate it. Question: are you guys doing a simple code-speak on here? the well handle for me was on the top LEFT of the last scene, not the right. Yes, it was on the top left of the last scene for me as well. EP, PP and AΩ - you are correct in that the well "handle" is indeed on the top left of the scene. Is the crowbar supposed to work on the nailed shut coffin? It's not for me. Eh, nvm. Missed an up arrow.